Manufacturers in many industries have continuous series of holes in product components parts that require drilling. A typical example is the railing industry that have bottom and top rail sections requiring precision drilled holes to locate and attach the railing spindles. A typical seven spindle head for drilling 3-1/2" center to center spaced spindle holes is shown. 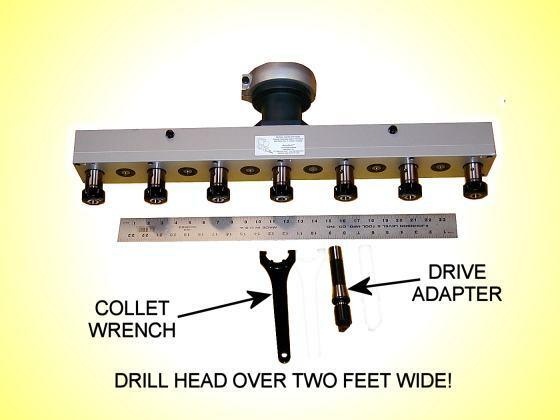 It has been made to quickly and easily attach to a larger industrial drill press. In this case the head is over two feet wide! The width limitation, in many cases, is based on the drill press table size or the drill press horsepower. We review your application, including the requirements of the drilling machine, to assure the success of your project.